When Beatrice gets a frantic call in the middle of Sunday lunch to say that her younger sister, Tess, is missing, she boards the first flight home to London. 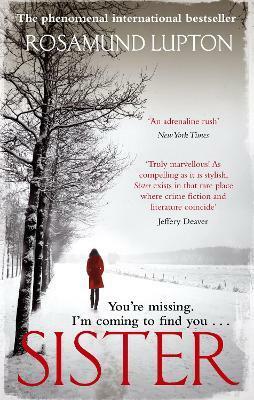 But as she learns about the circumstances surrounding her Tess's disappearance, she is stunned to discover how little she actually knows of her sister's life - and unprepared for the terrifying truths she must now face. The police, Beatrice's fiance and even her mother accept they have lost Tess, but Beatrice refuses to give up on her. So she embarks on a dangerous journey to discover the truth, no matter the cost. For years Rosamund Lupton has been a script writer for the BBC. She lives in London with her husband - a doctor - and two children. This is her debut novel.